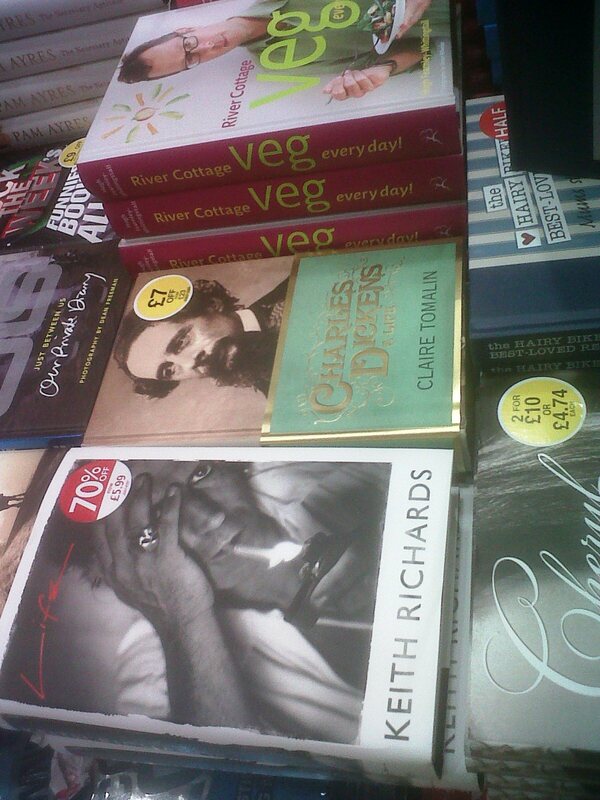 WH Smith – how does it keep on squeezing those margins? I mentioned WH Smith’s continued walk-on-water results in my last post, with sales down and operating margins up, and I’ve started to worry that I might be obsessing about a single brand. However, on reflection, this is understandable – Smiths is the only retailer in the book sector whose current performance is visible to the public. Waterstone’s is now privately held, so it’ll join Foyle’s with Companies House filings only published many months after they cease to be relevant. And Amazon of course never breaks out UK performance, and reveals no more than it chooses to through its Luxembourg base. But, spitting feathers aside, and noting obvious savings in staff costs, shop-fit etc, where is WHS’s continual margin gain coming from? With twenty minutes to kill in their new store at Westfield Stratford yesterday, I went strategy spotting. One of the best ways to drive margin is through own-brand, and WHS continues to extend own-brand and unique stock throughout all its categories. WHS has always carried a sizeable slug of own-brand stationery and the like, but many of its categories are now dominated by own-brand to an unprecedented degree. Take calendars. There are multiple suppliers of wall calendars in the market. Some of them own valuable IP – eg Top Gear, The Simpsons – but a large proportion of the market is generic – kittens, landscapes etc. And WHS (at least in Westfield) no longer stocks generic calendars that aren’t own-brand. The opportunities to increase margin are significant. Value publishing – creating attractive books to be sold at a lower-than-expected price – has been a staple of store chains like The Works for many years. It served us well at Borders, and WHS has always had a toe in the water, but its commitment to value publishing is now more substantial, and takes many forms. Value titles are no longer separated out, highlighted as “second-class” goods – they’re integrated into the main offer. Placed strategically close to the Guinness World Records dumpbin is a selection of similar facts’n’entertainment titles like “You Won’t Believe It But…”, “Gruesome Facts”, “Planet Earth” and so on. These are retailing for £5, half the price of Guinness (which in turn is nominally 50% off its £20 RRP, though I defy you to find any chain merchant selling it for over a tenner). WHS offers a cheap alternative to Guinness which isn’t as time-sensitive, and will earn a higher cash margin per unit sold than Guinness. Win-win. 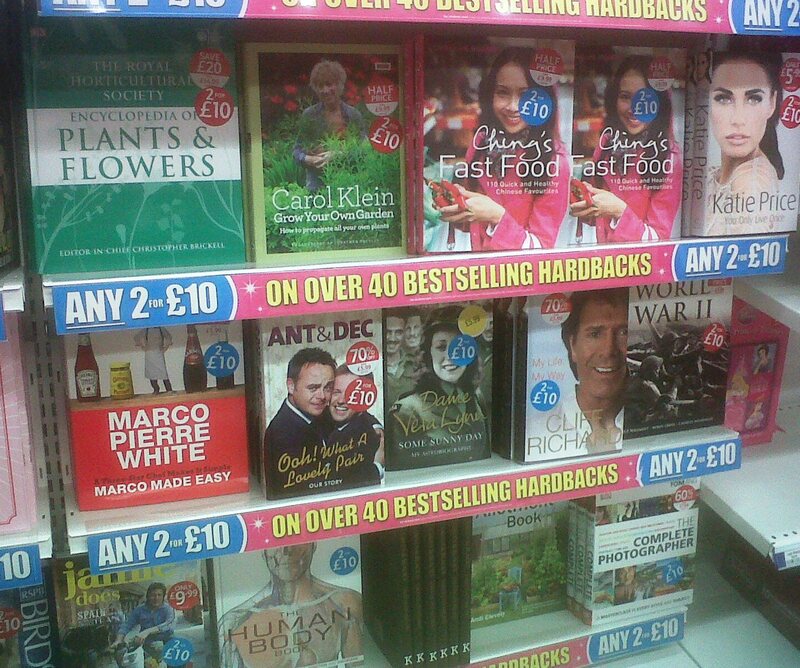 Now, here’s an interesting offer – any two for £10 on over forty best-selling hardbacks. The Keith Richards was a huge success last year, and representing it for Christmas 2011 works for everyone. At 70% off, it’s retailing for £6 – somewhat higher than a traditional remainder seller would price it, but excellent value nevertheless. 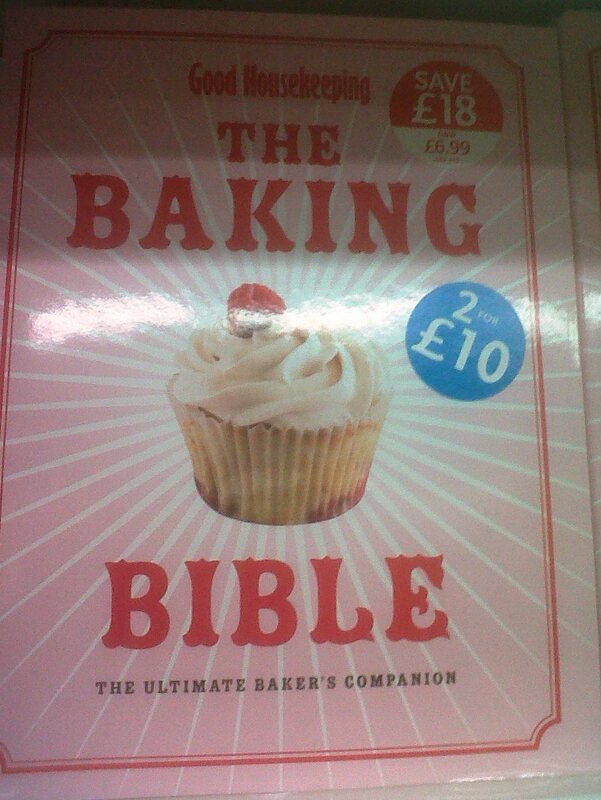 Elsewhere, WHS has bought heavily into what is essentially “Jamie Oliver’s Greatest Hits”, a collection featuring previously published recipes from all over Europe, priced to sell at £9.99. This is more heavily featured, and more cheaply priced than this season’s new Jamie – and as a recipe selection, it may well be more attractive to many customers. Given WHS’s stock commitment, a better cash margin also looks likely. These are just a few examples, culled from a brief stroll around one store, but they underline WH Smith’s absolute commitment to creating a consumer offer that will drive the strongest possible margin. Lest this sounds merely blindingly obvious to any general retailer, this isn’t how a traditional bookshop works – stock selection is driven by frontlist publishing, and by the creation and maintenance of a diverse and credible backlist range. The bookseller will haggle with the publisher for margin and payment terms, marketing support etc, but their commitment to the “right” titles will limit their ability to grow margin. What WH Smith has done is to free itself from the old dependence that retailers of copyright products (books, news/mags, music, movies, games etc) have on producers, by analysing what its customers want to buy, turning the screws on suppliers in exchange for exclusive deals and big buys, and generating large volumes of unique and own-brand stock across all categories, from bookazines to giftwrap. I still share the general bogglement at Smiths’ ability to keep pulling off this trick, again and again – last month, Kate Swann announced that a further £11m-worth of savings had been identified across the business. And I wholly understand the dismay that Mary Portas and many others have in the current WH Smith store environment – these are no longer pleasant stores. (Younger readers, when I were a boy, WHS and John Lewis felt very similar to each other…) But WHS now has a much greater level of control over what they stock and sell. How all of this will fare if digital content takes over 50% of the book market (and the magazine market?) is hard to say, but as a survival strategy this looks more robust (if less attractive) than that of the old “stockholding bookshop”. Arts Correspondent Will Gompertz talks to Penguin’s John Makinson, The Bookseller’s Neill Denny and blogger Adrian Hon about the impact of digitisation on books and publishing. It’s an interesting listen, but the element that has stuck with me is the vox pop half way through, wherein we hear from a Foyle’s customer, interviewed on the Charing Cross Road pavement. I may be extrapolating a little too much from a snatched moment on-mike, but those who consume books, rather than fetishising bookshops, are likely to be thinking more and more in this way. Which in turn supports the appearance of the Assouline shop inside Liberty on Great Marlborough Street. Like all department stores, Liberty used to have an eclectic book department which reflected its clientèle and their interests. 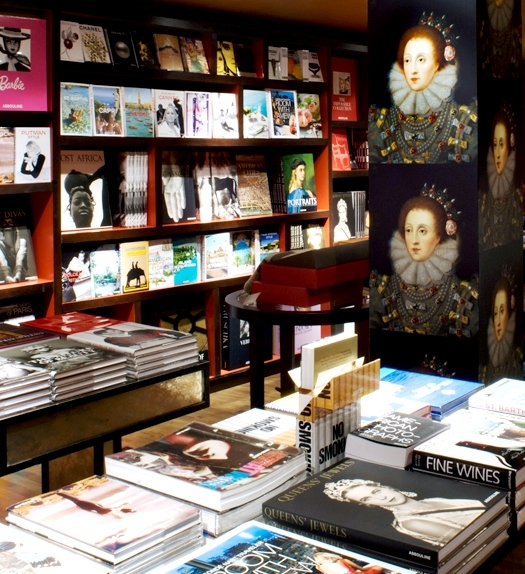 There are still some gift books on tables here and there elsewhere in the store, but Assouline provides the mad fling or naughty treat – with prices from around £20 to hundreds of pounds. I like the Assouline offer, and I thought their second-hand section (branded “Vintage”, like a classic Yves St Laurent frock, and priced accordingly) was very cleverly done. But Liberty customers, like the woman outside Foyle’s, will get their bread-and-butter books (physical or digital) from Amazon. The book as a collectible or an extravagance, rather than a staple, moves another step closer. Foyles announced yesterday that they will be opening a 5,000 sq ft bookshop in the new Westfield mall at Stratford City in east London. This is a bold move, perhaps even a brave one. “Stratford City” is an interesting new conceit, the result of many years’ planning and the Olympic fillip. Not everybody is happy that this massive development has landed in a previously unconsidered old corner of Hackney – marshes, roads and railways, light industry and playing fields have been subjected to comprehensive redevelopment. Iain Sinclair was waxing lyrical about the subject on yesterday’s Start The Week (about 15 minutes in). 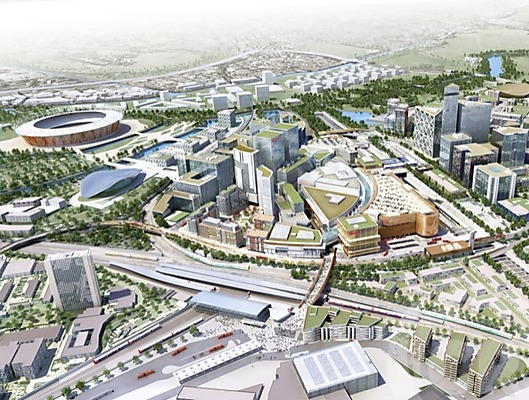 Once the Olympics have come and gone, we will be left with a cluster of over-specced sports facilities, offices, housing, and the largest urban shopping centre in Europe, with 1,900,000 sq ft of letable space. 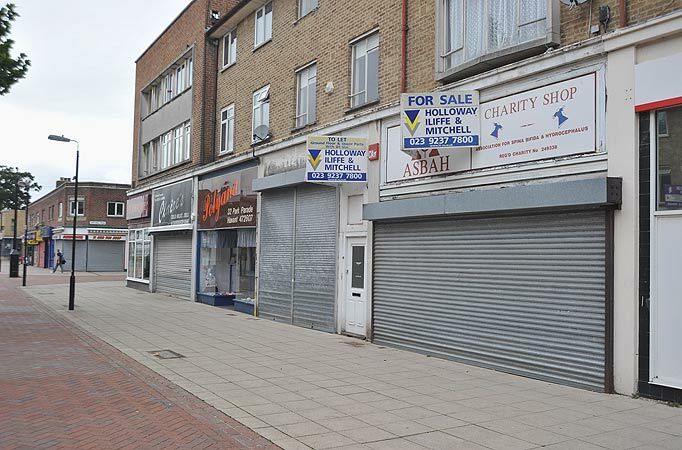 Developments like Westfield Stratford should, amongst other objectives, regenerate a previuously run-down area. Old Stratford was certainly a mess, and New Stratford will have plenty of new housing and employment opportunities that should benefit the immediate area. “Should” – but will they? I was struck, working through the Westfield website, by the extent to which ease-of-access is promoted – in other words, if you live somewhere else – somewhere “nicer” – then you’ll eventually be able to get into Westfield via one of eight different rail lines. The mall sits conventiently on top of the rail interchange, so the visitor should be able to remain pretty much hermetically sealed off from the East End. Westfield Stratford could be anywhere – unless you choose to use your car; the local road network has always been choked (you’ll have heard the words “Blackwall Tunnel Northern Approach” a few times on the traffic news), so driving in will be quite an expedition for the target market. I need to take care that I’m not biting the hand that’s fed me; I support new shopping schemes, and I’ll defend the customer’s right to buy what they choose, wherever and whenever they like. 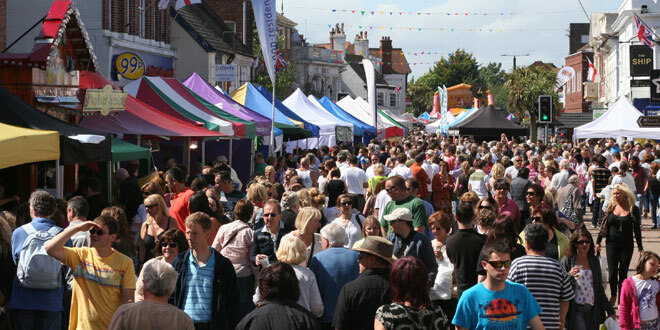 If, for instance, consumers want retail parks, then rethink the high street, rather than denying them the convenience and value that out-of-town provides. What’s interesting with Westfield is that it sits in the heart of the old East End. If it’s mid-market (as the list of tenants here seems to suggest), then will it primarily cater to local shoppers, taking shoppers from Ilford and the multitude of small local centres like East Ham and Leyton? Or, to stack up financially, is it reliant on a target customer who will travel a much greater distance than is typical in London, passing through neighbourhoods largely untouched by the new mall’s benefits? Back in the boom years, Borders opened a series of retail park stores in “untraditional” bookstore locations – Ellesmere Port (chemical works and car factory), Kinnaird (closed mines), Silverlink (old light industrial/residential) – which were among our most profitable and sustainable shops. (Two of those three went to HMV/Waterstone’s and continued to trade.) The principle worked in shopping parks like Teesside, Stockport and Inverness as well. 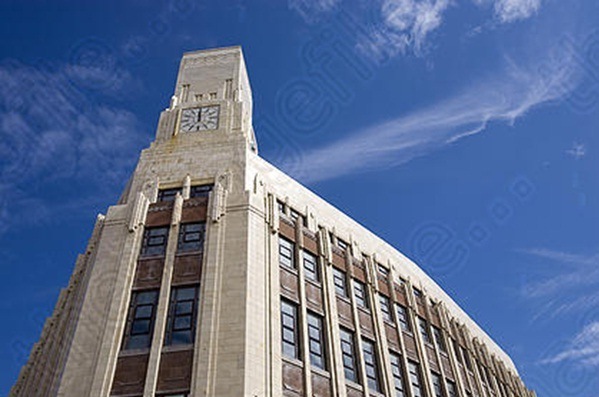 However, inside the M25 we had a mighty struggle – Lakeside and Gallions in East London, and Brent Cross on the North Circular under-performed, despite the inspirational hard work of shop managers and booksellers. Londoners found travelling across town was too difficult and demanding; they had the West End (and all its satellites), had strong shopping at their workplace (eg Canary Wharf, Covent Garden), had a high street at home, and didn’t need to make the effort to travel further. At the risk of passing myself off as a faux-Iain Sinclair, London is different. It’s a city state with its own rules and habits. Without trampling on regional sensibilities too heavily, what works in Dundee can work in Cardiff or Bristol, but every borough in London is unique. Which brings us to Foyles. Mall developers have always liked to woo bookshops – we’re quite good at using otherwise trickily configured space, and we add variety and interest to a mall, particularly if we can enhance the children’s offer (and provide a Dads’ sanctuary amongst the Haynes guides). However, malls are not high streets – they rarely boast dry-cleaners, pubs or betting shops, and they use the magnet of Big Stores (JLP and M&S so far at Stratford) and Big Fashion to draw in a predominately young, female, clothes-conscious crowd. A bookshop in a new mall feels a little out-of-place (think Waterstone’s at Reading Oracle), and has to work hard to achieve strong sales densities, particularly in the higher-margin backlist. 5,000 out of 1.9m square feet is almost incalculably small (though it’s the right size for a modern bookshop). Foyles has form – all its most recent openings have been in malls (Westfield White City, One New Change, Bristol Cabot), so there is clearly a strategy at work here. All of their small stores are interesting, and the RFH shop is one of the most rewarding in London. There are plenty of urban locations, similar to those where Booksetc. once thrived, less suited to Daunt Books’ upmarket specificity or Waterstone’s inevitable “chain-ness”, which would suit Foyles well. It’ll be interesting to watch the strategy develop, and I wish them every success. Foyle’s has announced a new store opening in the centre of Bristol. This is bold – anyone opening a new bookshop deserves our encouragement in a time of fast change and uncertain economics. 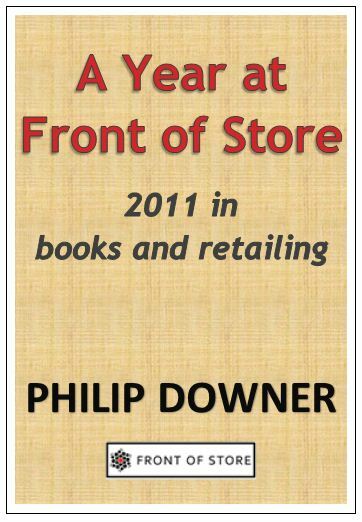 Foyle’s is ramping up its openings, with One New Change only a couple of months old at the time of writing. Bristol is a sound choice – one of Borders’ most profitable stores was in Clifton, where a succession of good managers ensured strong sales from an educated, informed and prosperous customer-base. The trick for Foyle’s is to translate all that we value in its Charing Cross Road store, into the smaller stores, so that it develops brand values that are as applicable in 5000 sq ft as they are in 50,000. Central Bristol has improved immeasurably with the opening of Cabot Circus; Foyle’s clearly has confidence in their smaller stores, so I shall be watching their first move from central London with great interest.